If the new Dante upset you, annoyed you, or indeed, made you want to say something about it at all, then he did exactly what Capcom hoped he would. The fan reaction when Capcom unveiled the new Devil May Cry at the Tokyo Game Show last month was mixed, thanks to the hefty makeover developer Ninja Theory had given lead character Dante. Ninja Theory defended Dante's new look, saying that it was a sorely needed update, but it turns out that there was more to it than that. According to Capcom, part of the reason for the radical new look was to shock people into talking about Devil May Cry again. 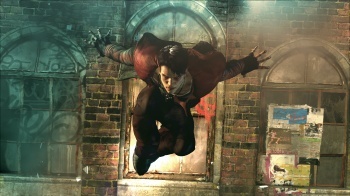 Capcom's Chris Svensson said that the company had been well aware the changes would evoke a very strong reaction in fans, and that it had deliberately asked Ninja Theory to come up with different and more creative designs. "The original concepts that came back for Dante were actually extremely close to the Dante everyone knows and loves," he explained. "The feedback that came back from [Keiji] Inafune and [Hideaki] Itsuno was, 'No guys, this needs to be completely different, we need you to go much further and be much more creative.'" He said that by mixing things up and getting people talking, Capcom dramatically raised the visibility of the game, and stopped it from being just another Devil May Cry. Svensson said not to expect any major changes to Dante's design before the game launches either, at least not until the end of the game. "This is meant to be an origin story," he said. "There are going to be some interesting changes and twists to what people think they know about Dante or where he came from." By saying that it was part of a strategy, Svensson makes it sound a little cold and clinical, like Capcom was manipulating its fans, but if you put aside the language that Svensson uses and look at what Capcom actually did, it's clearly just an attempt to revitialize the series and make it exciting again. After the excesses of Devil May Cry 4, it might be just what the series needs.